I was not supposed to go inside a glacier. Nope. Not one step. I had been tricked. And yet, here I was. Inside a sheet of ice, tens of thousands of years old. The familiar feelings of fear and awe swept over me again. And yet this time, though the scope of the glacier is big, it was the fact of time that really got me. The time it took to make this glacier - and we could see it. In the ice. By looking at the ice, I was literally looking through time. Our day began in Chamonix. We took a train up the hill to the Mer de Glace glacier. I had made an agreement with Spencer that we wouldn’t go into the glacier. Frankly, I didn’t even want to descend the long stairs towards it, because I had been so overwhelmed by nature on this trip and just wanted one day of comfort, haha. But when we arrived on the platform, I was fascinated by the story of how the glacier had been receding - and quite rapidly receding, over the last several years. We started the climb down, down down, passing signs with years along the way. We quickly got into the 20th century, and before we knew it, we were making huge leaps from the years we were born to the years we graduated from high school to the year we got married. And we still had so far to go to get to the bottom. Global warming is a real threat, but this was one of the first times I was able to see a tangible realization of that threat. This glacier that had been formed over thousands of years was rapidly shrinking because of human action. We are deep into the anthropocene now. This glacier - and the hike towards it - is proof. “Yes, yes, of course,” he kept replying. Here’s a picture of me. Standing in the glacier. I had to go in. I was standing outside the entrance, watching Spencer walk in (“I’ll just be a few minutes,” he said), and I knew that I’d regret it forever if I didn’t go inside. I knew that I’d look back on this moment, telling stories about it to my kids years from now, and I didn’t want to say, “I missed out. That glacier is smaller now, and you can’t even go inside it anymore.” No. That wasn’t going to happen. I wanted to be brave. I wanted to know more. And so I did it. I walked inside. And then he reached out and touched it. “DON’T TOUCH THE GLACIER,” I shouted, in a whisper not to attract attention. Ever aware of the fact of time represented in these walls of ice, all of the sudden, as I watched his hand move towards the carved ice, I realized that there was more than just water inside. There is air. Minerals. Maybe even animals. And terrifyingly, what about disease? I laugh now at the thought, but still don’t know to this day if something like that could survive the time, force, pressure, and temperature of a glacier this old. Either way, I still made him use hand sanitizer! It’s a small world they say. At least that’s what we said when we took our first Rick Steve’s tour in 2016. A guided tour of Italy. At the kick off meeting of the tour, we met a lovely family who coincidentally were from the exact same town as us: Boulder, Colorado. What are the odds that on the other side of the planet, of all the families and people who would could be part of our tour group, there was this family of 4 from the same town where Anne and I lived and grew up? It was nice to have so much in common with this tribe as we toured around Italy. Go early. That is all. We had arrived to the top of the Schiltorn on the first, maybe the second, tram of the day to the summit. We shared the cabin with no more than 5 or 6 others, most of whom were on their way to work at the summit’s spinning restaurant and other facilities. The operator greeted us with a smile and rattled off quite a bit of German before I explained to him as best that I could that I did not speak the language well. I beamed with pride the rest of the ride for having been mistaken - maybe, just maybe - for a local, just like the others in the cabin, commuting to work for the day. Buy cheese, buy wine, find a bench. Life need not be complicated to be extraordinary. While this picture does show a truly extraordinary view, that was just part of what made the moment it was taken in special. Not shown is the small brick of local cheese and small bottle of white wine that was shared with my partner while we quietly marveled at this view. It was those two things and the simple story behind them that made this moment truly special. One of the best things about traveling with Rick Steves is the company of your fellow tour members. I’ve always found them to be personable, generous, charismatic and interesting people with amazing life stories. The most remarkable in recent memory was a middle aged man named Pat. Pat went out of his way to get to know everyone on the tour. He’d ask you questions like “whats the most dangerous thing you’ve ever done?” It seemed like he had a specific question for each member of the group. It didn’t matter who you were or what your interests were, or if you had anything in common, he’d manage to hold a conversation with you for over an hour. My favorite quirk of his was his knowledge of the game of chess. While in Lauterbrunnen, there was a small lobby with a TV just inside the hotel entrance. Many of us on on the tour would start and end our day here with coffee in the morning and several cold beers at night. Especially since the World Cup was on! We watched several matches together throughout the trip, and some of the most exciting while in Lauterbrunnen. In the middle of the group of chairs we congregated at was a small coffee table and a chess board, its pieces set up in orderly fashion. Pat would come in to the small lounge, sit down across the board from you, without speaking. 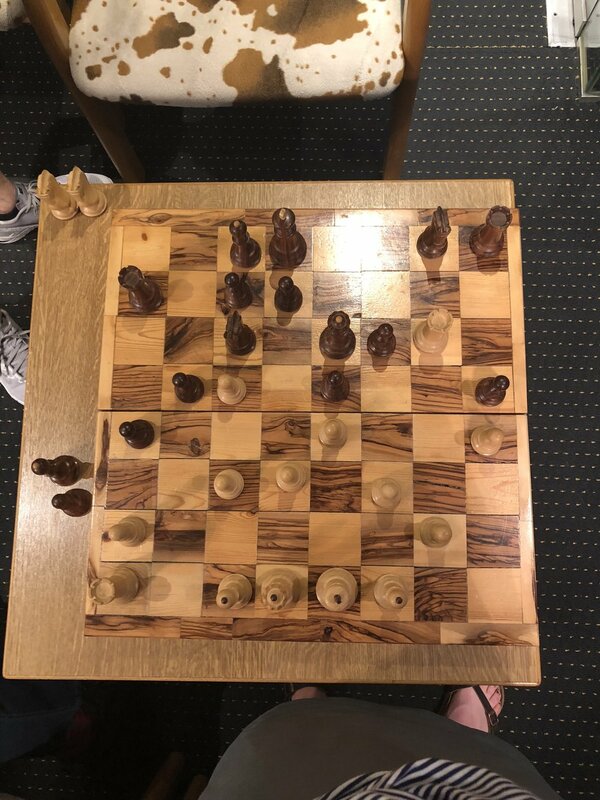 Only after you made meaningful eye contact with him would he reach down and advance one of the pawns on his side of the board. The game had started. He’d converse pleasantly with everyone over these games - young or old, it didn’t matter. He’d coach you on your moves and strategy, and it was hard to tell sometimes if you were being baited into a risky move. You were never quite sure. Eventually, you could always tell if Pat had made it back from his hiking at the end of each day in the valley, because the chess board would be set crisply, all pieces in their starting positions. That is, except for one, lone pawn, advanced forward in the classical starting chess move - the optimal two spaces. And if you sat down to counter the move, Pat would likely appear, suddenly, right before your very eyes. Have you ever heard the story about Carl Sagan and the “pale blue dot”? Legendary astrophysicist, Carl Sagan, wrote in his book Pale Blue Dot about an image he suggested astronomer’s took of Earth as the spacecraft “Voyager I” left our solar system in 1990. The image isn’t much - it’s mostly just a grainy, black-grey picture with a white speck in the middle. But that speck is Earth. We’re really, really small. We’re just a “pale blue dot,” Sagan says. Sagan goes on to describe how this one image, this one little speck, threw human existence into relief for him. He never saw Earth the same again. Despite how big, powerful, smart, or rich we think we are - we are actually really, really small. Seemingly inconsequential. When I stepped foot into the Lauterbrunnen Valley, that is how I felt. Really, really small. Seemingly inconsequential. In comparison to these peaks, just a speck. Ever the moon, my confidant. Our posturings, our imagined self-importance, the delusion that we have some privileged position in the Universe, are challenged by this point of pale light. Our planet is a lonely speck in the great enveloping cosmic dark. In our obscurity, in all this vastness, there is no hint that help will come from elsewhere to save us from ourselves. I had been overwhelmed by the size of the Alps in the Dolomites, but the Lauterbrunnen Valley - with the Monch, Eiger, and Jungfrau peaks standing mightily overhead - brought me to my knees. Literally. I got off the cable car in Grütschalp and had to sit down. I kept saying to Spencer, “why isn’t everyone just falling to their knees in awe?” I was shocked at how calm everyone seemed to be. I wanted to cry. Never, ever before have I felt so small, and so impressed by the majesty of something so massive and beautiful. In fact, I was reminded of my time growing up in the church. During a particularly charismatic worship service, when I felt transcendence and close to God, my hands outstretched, my cheeks wet with tears over the impressions of divine love I felt on my heart - I had this feeling again when I looked upon these peaks. I’m smiling. But don’t be fooled. I was overwhelmed with the sights of these mountains. We started off on our hike from Grütschalp to Mürren, and the weather couldn’t have been more perfect. I knew that if I just started walking, eventually I’d calm down. Though it took longer than I expected, eventually I found my breath and bearings again, and was able to admire the view without wanting to fall to my knees in tears. And our walk together was wonderful. The path wasn’t steep, it was generally quiet with only a few passerby’s now and then, and we were able to really catch up and connect after a week or so of intense, busy travel. One of the things I love most about Spencer is that he really understands and shares my love for learning, and when I brought up Carl Sagan’s “Pale Blue Dot,” he knew exactly what we were talking about. On the hike to Mürren, we talked all about the scope universe, astrophysics, and God. But our deep conversations about the meaning of life were interrupted by the sound of cow bells. Though they started out faint, eventually, as we kept walking, they grew louder and louder - until a large herd of cows emerged as we turned a corner. They were clearly on their way to dinner, walking with a purpose as a group towards what seemed to them to be a delicious patch of grass - right in the middle of the path we were on. Once we got to Mürren, we found a restaurant overlooking the mountain range, and had the most delicious meal we’ve had on this trip - I think it’s arguably the best meal we’ve ever had in Europe! I will never, ever forgot this hike. The cows. The views. The pale blue dot. Our first introduction to the Alps was the Italian Dolomites, also known as Alpe Di Suisi. We were blown away. Absolutely floored. We thought, having grown up in Colorado, that we knew what big mountains looked like. We were wrong. Just. Plain. Wrong. Little Castelrotto is a charming little town rich with history. This area of Italy was actually part of Austria up until the end of World War 1, and most people in town still speak German as their first language! It really feels like you’re still in Austria, even though it’s technically Italy. When we arrived in Salzburg on our first day, and went on an orientation tour of town with our tour manager, Gretchen, she began pointing out these bronze “stumbling stones” that are set into the streets. These stones are markers to honor those people who were taken and murdered during the Holocaust. And we saw them all over town - one after another after another… It was a really powerful experience. Salzburg is now one of my favorite cities in Europe. So much of the history has been preserved in the old town center, including history I’ve never come face-to-face with, like the influence of Nazi Germany during WW2. We also loved touring the Fortress, attending a classical music concert, and going on a Sound of Music bike tour! There are many things in life that are universal. Music for instance. Notes written on paper by a French composer could surely be played by anyone in the world with knowledge of how to read music. Such was our experience participating in a CrossFit class (CrossFit is an exercise methodology popular throughout the world) in Salzburg. Our last day in London was spent doing one of the most fun, commemorative activities we planned to celebrate 15 years together: a couple’s photo session! We worked with Siobhan Watts. I would now recommend this type of experience to everyone to remember these special memories and seasons of life! Our second day in London was one of my favorite London days ever. We started out with a wander through the Seven Dials neighborhood of central London - and found the best almond croissant of all time! - before heading out to Greenwich and the Royal Observatory. The weather was perfect, too. Growing up in the United States in the 21st century, it is fairly easy to live life without ever thinking about the effects of war and global imperial projects. But in London, if you keep your eyes open, the evidence is all around you. Pock marks on the sides of buildings from the Blitz during WW2. A field of poppies to honor those who fell in WW1. And the diverse foods and cultural influences from many of Britain’s former colonies. When we visited the Imperial War Museum and the British Museum on this trip, I was really overwhelmed with emotion as I came closer-than-ever before to the effects and brutality of war. We just have so much privilege. Accepting that and learning that is critical, challenging, and illuminating, but doing so will help us be more informed, empathetic, justice-driven citizens of the world. We flew overnight from New York - JFK to London Heathrow, and landed early in the morning, UK time. Exhausted but excited, we took the Tube into the city, and dropped our bags off at our hotel. We resisted falling into bed, taking Rick’s advice seriously that the best cure for jet lag is sunshine. So, off we went to explore!